The Gemco 955 Series BRIK Linear Displacement Transducer (LDT) is a linear position sensor developed to meet the most demanding processing challenges. The 955 Series is easy to install and set up, and features the latest generation of Magnetostrictive position-sensing technology and offers absolute position feedback. A magnet assembly moves over the sensing element that determines the position and converts it to a readable output. The BRIK is a self-contained unit and does not have a can or head assembly. All of the electronics are incorporated in the sensor; which is less than one inch tall. It is available in analog, digital and quadrature outputs. This linear position sensor can be a cost effective replacement to limit and proximity sensors and linear potentiometers. Applications include Presses, Injection Molding, Web Tensioning, Tire & Rubber, Roll positioning and many more. • Sensor Length up to 180"
The 955 eBrik II Linear Displacement Transducer (LDT) is an accurate, programmable zero and span, auto-tuning, non-contact linear position sensor in an economical, low-profile package. The sensor utilizes our field-proven Magnetostrictive technology to provide absolute position, repeatable to .001% of the sensing distance. The 955 eBrik II™ is a cost effective linear sensing solution. The streamlined anodized aluminum extrusion houses the sensing element and electronics. The magnet moves over the sensing element that determines the position and converts it to a readable output. The 955 eBrik II is a self-contained unit and does not have a “can” or head assembly. All of the electronics are incorporated in the sensor, which is less than one inch tall. The 955 eBrik can be ordered in span lengths from 1 inches to 74 inches long in 1 inch increments. The magnet slide is designed to move effortlessly along the sensor in guide tracks or a floating magnet assembly can be positioned above the unit. Applications include: Presses, injection molding, dancer control, Tire & Rubber and many more. The 955A Brik Linear Displacement Transducer (LDT) is an accurate, programmable zero and span, non-contact linear position sensor in an economical, low profile package. The Brik is a self-contained unit and does not have a can or head assembly. All of the electronics are incorporated in the sensor which is less than one inch tall. It is available with analog outputs. The 955A Brik can be ordered in span lengths from 5 inches to 180 inches long in 0.1 inch increments. The magnet slide is designed to move effortlessly along the sensor in guide tracks or a floating magnet assembly can be positioned above the unit. Applications include: Presses, injection molding, extrusion, roll positioning, dancer control, Tire & Rubber and many more. The 955S Smart Brik Linear Displacement Transducer (LDT) is an accurate, programmable zero and span, non-contact linear position sensor in an economical, low profile package. The Brik is a self-contained unit and does not have a can or head assembly. All of the electronics are incorporated in the sensor which is less than one inch tall. It is available with analog outputs. The 955S Smart Brik can be ordered in span lengths from 4 inches to 180 inches long in 0.1 inch increments. The magnet slide is designed to move effortlessly along the sensor in guide tracks or a floating magnet assembly can be positioned above the unit. Applications include: Presses, injection molding, extrusion, roll positioning, dancer control, Tire and Rubber and many more. The 955LC BRIK Linear Displacement Transducer (LDT) is an accurate, non-contact linear position sensor in an economical, low profile package. The BRIK is a self-contained unit and does not have a can or head assembly. All of the electronics are incorporated in the sensor which is less than one inch tall. It is available with voltage or current outputs. Units can be ordered in span lengths from 6 inches up to 180 inches long in 0.1 inch increments. The magnet slide is designed to move effortlessly along the sensor in guide tracks or a floating magnet assembly can be positioned above the unit. The magnet slide is designed to move effortlessly along the transducer in guide tracks. The 955CA BRIK Gen III Linear Displacement Transducer (LDT) is an accurate programmable, auto tuning, non-contact, linear position sensor in an economical, low profile package. The position sensor utilizes our field proven Magnetostrictive technology to give absolute position, repeatable to .006% of the programmable sensing distance. The streamlined anodized aluminum extrusion houses the sensing element and electronics. The unit is designed to mount on top of a pneumatic cylinder and detect the movable magnet within the cylinder. It can be ordered with voltage, current, digital and Quadrature outputs. The 955D Brik Linear Displacement Transducer (LDT) is an accurate, non-contact linear position sensor in an economical, low profile package. The Brik is a self-contained unit and does not have a can or head assembly. All of the electronics are incorporated in the sensor which is less than one inch tall. The 955D is available in digital (Start/Stop, PWM and Control Pulse) outputs. The Brik can be ordered in span lengths from 5 inches to 180 inches long in 0.1 inch increments. The magnet slide is designed to move effortlessly along the sensor in guide tracks or a floating magnet assembly can be positioned above the unit. Applications include: Presses, injection molding, lumber, extrusion, roll positioning, dancer control and many more. The 955DQ Brik Linear Displacement Transducer (LDT) is an accurate, non-contact linear position sensor in an economical, low profile package. The Brik is a self-contained unit and does not have a can or head assembly. All of the electronics are incorporated in the transducer which is less than one inch tall. The 955DQ is available with Quadrature outputs. This new method of interfacing Magnetostrictive transducers offers an interface as common as analog but with the speed and accuracy of pulsed type signaling. 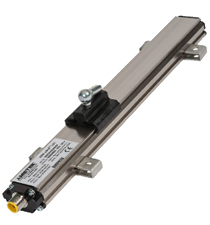 The Gemco 955DQ linear transducer provides quadrature output directly from the transducer to the controller. The output from the transducer can be wired directly to any incremental encoder input card, without the need for a special converter module or a PLC interface card designed specifically for use with a pulsed output Magnetostrictive transducer. The Brik can be ordered in span lengths from 5 inches to 180 inches long in 0.1 inch increments. The magnet slide is designed to move effortlessly along the transducer in guide tracks or a floating magnet assembly can be positioned above the unit. Applications include: Presses, injection molding, lumber, extrusion, roll positioning, dancer control and many more. Part No. : 9551409 In-Line Programming Unit - a remote programmer that can help simplify the programming process. The programmer is a portable device that can be temporarily or permanently in series with our analog LDTs that use 4 or 5 pin M12 connector options. Automate each log to determine the maximum number of boards that can be produced.